Kenmore 12" Table Fan Just $9.79! Down From $25! You are here: Home / Great Deals / Kenmore 12″ Table Fan Just $9.79! Down From $25! Kenmore 12″ Table Fan Just $9.79! Down From $25! Kenmore 12″ Table Fan Just $9.79! Down From $25!! Sears has this Kenmore 12″ Table Fan on sale for just $19.99 (Reg. $25) and Shop Your Members can get back $10.20 in points, making it only $9.79! 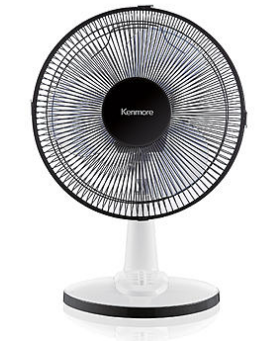 The Kenmore 12″ Table Fan is perfect for use in bedrooms and small living areas. It’s small footprint is great for tables, dressers, countertops and more. The adjustable tilt head lets you direct airflow where you want it, and the easy-push 3 speed settings let you take control effortlessly.